To answer those that say immigration is at an all time high, here are the numbers. The immigration numbers are from the Migration Policy Institute and the population numbers are from the US Census. I am sure there are immigration numbers in the census, but I could not find them. If anyone wants to point me to them I will remake the charts. 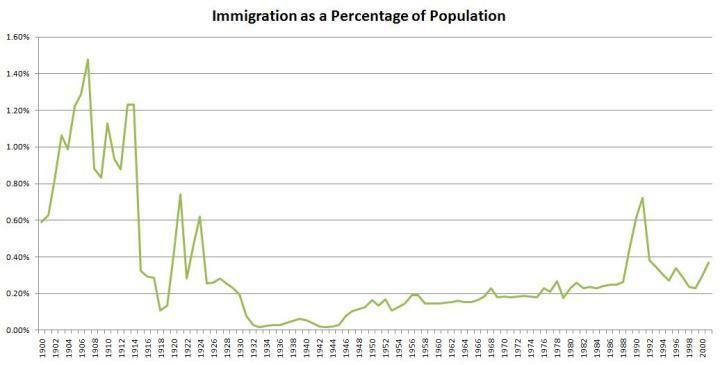 The short story is that annual immigration hit 1.285 million people in 1907 -- which at the time was 1.5% of the population, and then declined all of the way down to .02% of the population in 1933 and did not exceed the 1907 number until 1990 when we hit 1.535 million people. By then the country had grown enough to make that only 0.62% of the population. In 2002, the last year for which I found data, we settled in at about 1 million people per year or .37% of the population.